Beta Chapter of Phi Delta Theta at UNC - Phi Delta Theta Welcomes New President of the House Corp.
As the incoming President of the N.C. Beta Foundation (the House corporation of the UNC Chapel Hill Phi Delta Theta Fraternity), I would like to take this opportunity to thank outgoing President Tom Kerns ’72. Tom has provided stellar leadership over the last several years, particularly during the planning and $800,000+ renovation of the House which became a reality after Steve Bell’s diligence in raising the necessary funds. Other members of the current Board are Steve Bell ’67, Bob Page ‘52 (Secretary- Treasurer), Randy Worth ’68, Ronnie Bagwell ’68, Peter Pace ’83, John Duckett ’09, and Scott Gunn ’10 (Chapter Advisor). As a member of the Board since 2011, along with having two Phi Delt sons, Campbell (freshman) and H.K. III ’14, I am very familiar with the workings of the Chapter. My goal is to continue to assist in preserving the Phi Delta Theta Chapter’s reputation as one of the most respected and well-kept fraternity houses on campus. Many generations have enjoyed the lifetime benefits and camaraderie of being a member of our wonderful organization. 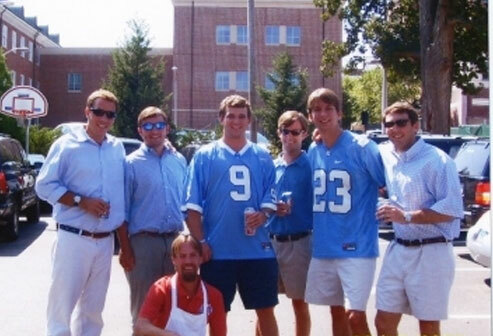 In order to survive as a fraternity today and to insure that the young men in our care have a decent place to eat, socialize and study while at UNC, alumni oversight of the Chapter is critical. The House is strong, and we currently have over 80 brothers as well as a fantastic cook and steward of the House, Tim Galliher, ably assisted by Sara Ayala and Lourdes Alvarez. We have a fun parents’ weekend in the fall, which has been coordinated by the Mothers of the Chapter members every year since 1999, sponsorship with the Pi Beta Phi sorority, the 8th annual Eve Carson 5K Run fundraiser, which raises over $130,000 annually, and numerous other charitable initiatives and events planned throughout the year. From our large philanthropic endeavors, down to our everyday character, we have proven ourselves stronger than other fraternities and have worked tirelessly over decades to earn goodwill in the eyes of the University and National Phi Delta Theta leaders. A special thanks goes to Bob Page, who has been the Secretary-Treasurer of the NC Beta Foundation for over 45 years and who has announced his pending retirement. Bob will remain with us until we can find a replacement to fill his role regarding communications, upkeep of the House, and finances.